BOM data listing consists of writing down the BOM decisions in a table whereas BOM management is using the BOM data to make better decisions for making better products. It might sound like semantics, but it makes a big difference. What would be the product’s cost and how is it divided across the different parts? What would be the cost difference between producing the plastic parts in China vs. locally? How about for the small plastic parts only? Which parts have the slowest delivery time? And how long in advance should we order them? Are there any existing parts we can re-use? Who decided to work with this supplier, and why? These are the kinds of questions that should be asked and answered all project long, and the sooner, the better. Unfortunately, in most cases, decision-making is based on professional experience and guess-timation, not on data. This is simply because it’s too damn messy and annoying to do all the needed analysis to answer these questions. As we know from other domains (such as online marketing, advertising, and more) adding data to the decision-making process can improve the results significantly. BOM is an essential part of your business. Give it the time, money, and management attention it deserves. 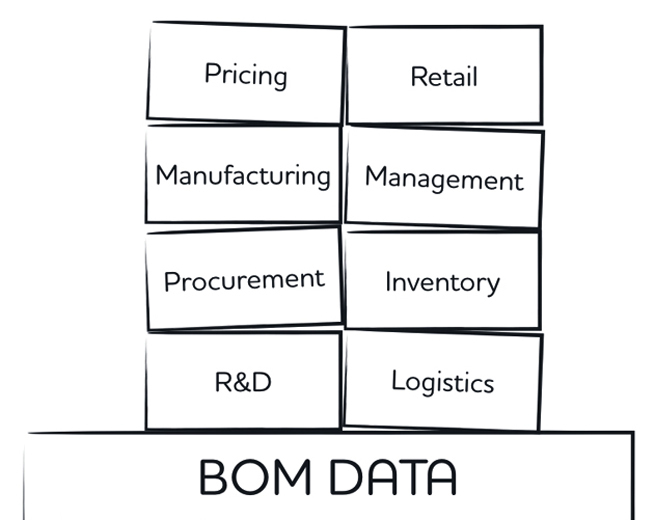 Some valuable insights are hidden inside your BOM data; make the efforts to uncover them. BOM data serves different departments in different ways – the same data is read and used differently by different areas of your business. Make sure everybody gets the view of the BOM that works for them. Keep one source of truth – never duplicate your original BOM so that you make sure everybody sees the same data. When you have different copies of the BOM moving around, no one is sure which one is correct and up-to-date. Manage versions and keep history to make sure everyone is on the same page. It also ensures that you have the option to roll back, and to be able to learn from your decisions, so you avoid repeating mistakes and make even better decisions in the future. Pick the right tool for the job – PLM and ERP systems use the BOM data, but they’re built to manage processes and operations, not to support your design iterations and decision-making. The BOM might seem like a boring simple 2D table that doesn’t require too much attention, but in reality it is a dynamic and deep database with a lot of relationships, options, and alternatives that describe how to build a product. Mismanaging the BOM data can be extremely costly, increase the time-to-market, and hurt the brand’s reputation. When managed properly, the BOM can also tell the entire story of why a product was designed the way it was, and support a dynamic, fast-changing R&D process. Managing your BOMs in a single system will help you find opportunities to improve your whole business. This entry was posted in Product Design Management and tagged BOM Management, Product Design, Product Design Management, R&D by Yariv Sade. Bookmark the permalink. Hi Yariv Sade, nice article indeed. You have missed the point when you say “PLM and ERP systems use the BOM data”. PLM does not use BOM data it is the single source of the truth for the BOM which is a critical piece of the product definition. Without process (change and configuration) management the BOM data is incomplete. BOM data is not a 2D table it is a 3D tree. The BOM is piece of a part definition not a stand alone table. What you saying is 100% correct and it doesn’t contradict my point of view, but strengthens it. By “PLM and ERP systems use the BOM data” I mean that the BOM data is normally uploaded to these systems when it’s done or nearly done at the end of the R&D and NPI. In most cases, the BOM data is managed on Excel sheets during the R&D, the phase when BOM decisions are taken.